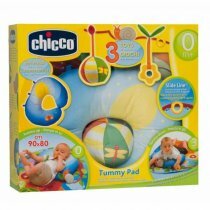 Tummy pad is a colourful super-soft pad that comes with its own pillow and 3 hanging toys creating a range of first activities and stimulation: a teething rattle, a soft multicoloured ball and a squeaking snail. The hanging toys can be clipped onto the pillow of the exclusive slideline system that allows positioning of the toys so that babies can reach them easily. The pillow is dual purpose pillow due to its particular shape:to start with, it allows babies to lie down and relax while they observe what is going on around them, then as they grow, they can lie on their tummies and play with the hanging toys which allows them to develop and experiment with their coordination skills. Maching washable.